There would come a time when Savoy Records would have many groups: the Dreams, Wanderers, Jive Bombers, 5 Wings, 5 Pennies, Carnations, Roamers, Carols, and Luther Bond & His Emeralds, just to name a few. But in the beginning, vocal groups were scarce on the label: 1943 had the Bunny Banks Trio (actually the Piccadilly Pipers); 1945 saw the Three Barons (actually the Three Riffs) and the Toppers (actually the 5 Red Caps). These were pretty much the only groups until the Robins came along in December of 1949. While both the Bunny Banks Trio/Piccadilly Pipers and the Robins had had a significant number of releases, by the time the 4 Buddies debuted in December 1950, both groups had stopped recording for the label. 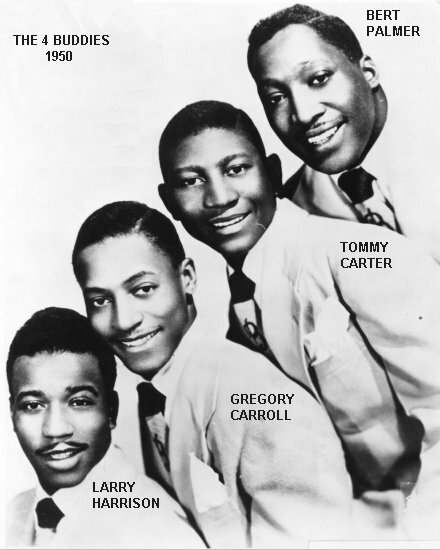 In all the time the 4 Buddies were together, they were the only Savoy group to have a Top 10 national R&B hit ("I Will Wait" reached #3 nationally). The only other Savoy acts to make the Top 10 in this period were Johnny Otis/Mel Walker, Varetta Dillard, and the Emitt Slay Trio. John Carroll and Leon "Larry" Harrison were from the Northwest Side of Baltimore, and had known each other since elementary school. (Note that at a later date John Carroll would begin calling himself "Gregory" Carroll as a stage name, and eventually make that his legal name). 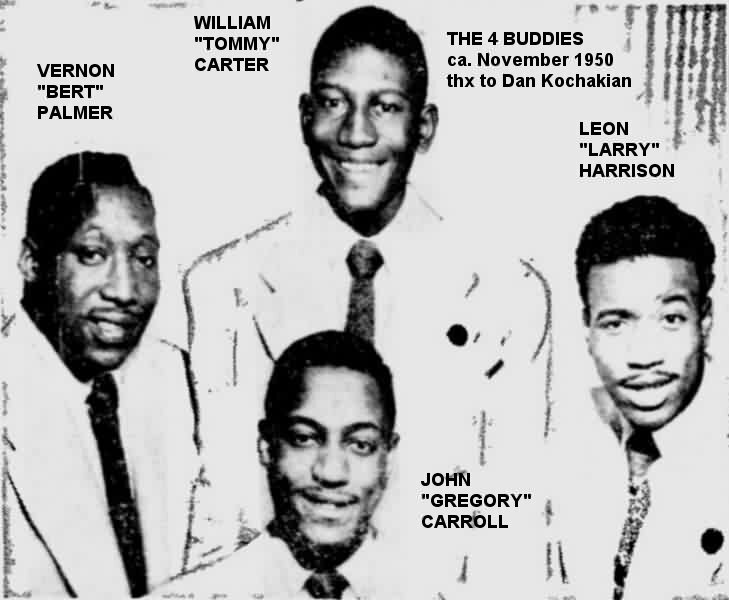 John's older brother, Charlie Carroll, had been in a group called the Four Buds, which had made some recordings with the Earl "Fatha" Hines orchestra. As a further influence, the Vibra-Naires/Orioles were friends from the same part of town; it seemed natural that John and Larry would sing. And sing they did, taking their talent to other parts of Baltimore. In this way they met William Duffy and Maurice "Tank" Hicks from the South Side. The four voices sounded good together, and by 1949, they had started calling themselves the Metronomes. Larry Harrison sang first tenor, John Carroll was the second tenor, William Duffy the baritone, and Maurice Hicks the bass. They were all between 16 and 18 years old. Practice paid off, and the Metronomes ended up with a 15-minute radio show, every Saturday, on Baltimore's WITH. Then, one day in late April 1950, they found themselves with a rare opportunity because Baltimore's Royal Theater was currently hosting the Johnny Otis Show. With Otis' "Double Crossing Blues" (featuring Little Esther and the Robins) still riding high on the charts, Savoy Records' owner, Herman Lubinsky, came down to Baltimore to record Esther and looked around for another group to back her in the same way the Robins had. The group he picked was the Metronomes. 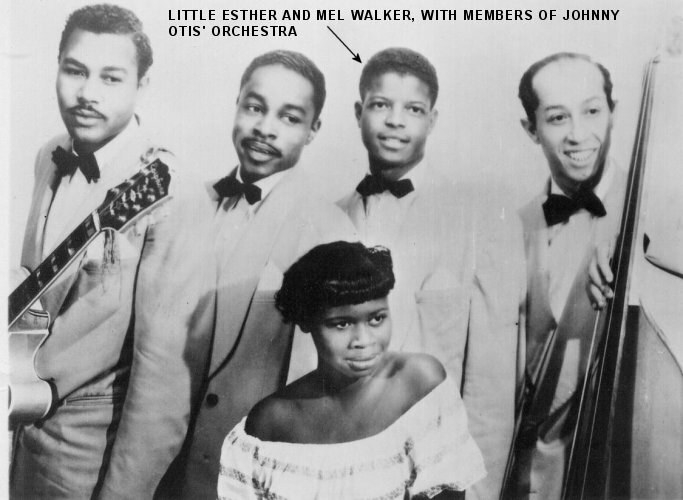 On May 3, 1950 the Metronomes recorded "Just Can't Get Free" behind Little Esther. It was released later that month, but the label had no mention of the Metronomes; for some reason, the group had magically become the "Beltones". Gregory Carroll says that the Metronomes also backed up Mel Walker that day. The only other known master from that session is SBA-674, "My Heart Tells Me," but there's no group present. There are no other SBA masters known ("SBA" stands for Savoy Baltimore), but the next 13 master numbers (through 687) are unaccounted for, so it's reasonable to suspect that a couple of them were used in Baltimore. If so, the Metronomes may have been on one or more; since the masters no longer seem to exist, we'll probably never know. Strangely, their contracts were executed the day after they recorded. On May 4, John Wayne Carroll, William M. Duffy, Maurice Hicks, and Leon Harrison signed on the dotted line. A few months later, John and Larry said "Hey, we've got a contract, why aren't we doing something about it?" They contacted Savoy and were invited to New York for a session. 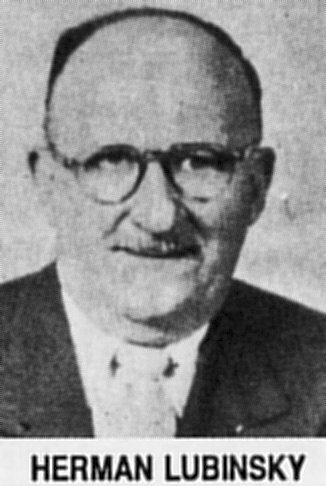 Although William Duffy and Maurice Hicks enjoyed the group's local success, they weren't confident enough to leave Baltimore (additionally, Duffy's first child had just been born). 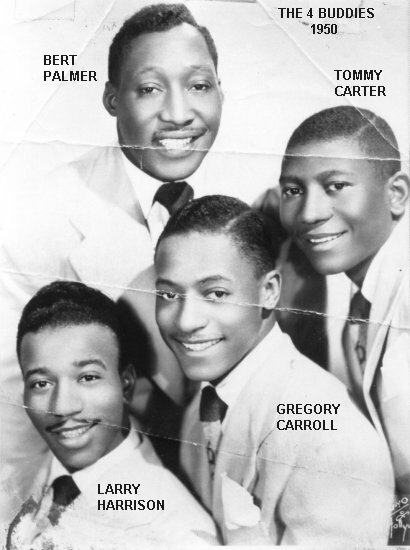 John and Larry got two friends as replacements: Vernon "Bert" Palmer (baritone) and William "Tommy" Carter (bass). After some intense practice, off to New York they went. 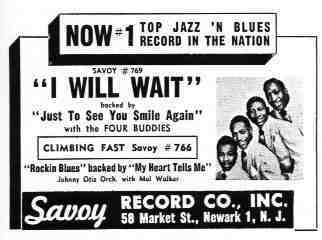 They signed their Savoy contracts on October 9, 1950, and, on October 12, they recorded "Just To See You Smile Again," "I Will Wait, "Why At A Time Like This," and "Don't Leave Me Now." Like the Orioles before them the group excelled at ballads, in fact, their first 12 recordings were ballads (this, in a time when an artist's uptempo tune was usually listed as the "A" side). In October, Savoy proudly announced the signing of Marilyn Scott, Mary DeLoach, the Jubilators (a six-man group whose secular songs would be released by Savoy as the "4 Barons"; they'd go on to become the Larks), and the Metronomes. An important change came out of that first session: the name "Metronomes" was dropped. A letter to the group in the Savoy files makes it official: by "mutual consent" the name was dropped in favor of "more of a commercial name." They first chose "Four Buds," after John's brother's group; the first pressing of "I Will Wait" shows this name. A little more thought then went into it and the feeling was that they didn't want to be associated with the original Four Buds' older form of music. The name was simply lengthened to "4 Buddies." Somehow, before their first record was even released, the 4 Buddies were booked into the Apollo Theater. 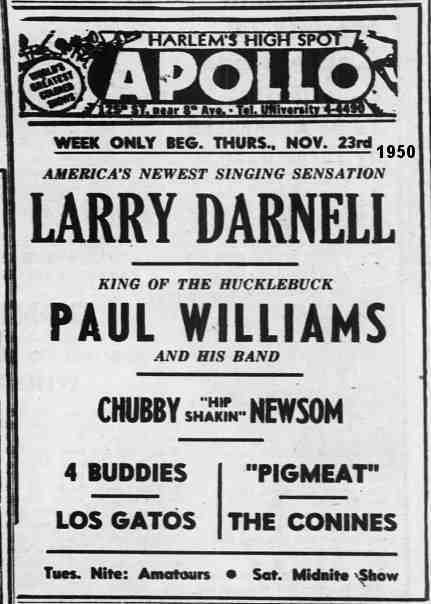 The week of November 23, 1950 saw them there, along with Larry Darnell, Chubby Newsome, and the Paul Williams Orchestra. This triumph was written up in the December 16, 1950 Baltimore Afro-American under the heading "Baltimore Group Makes Good In NYC": "The Four Buddies, a group of Baltimore boys who have made good in New York, recently closed a successful engagement at Harlem's Apollo Theater and went into Broadway's Palace Theater on Dec. 7." "I Will Wait"/"Just To See You Smile Again" were released in December, 1950, just in time to compete with the Dominoes' first recording, "Do Something For Me." The Dominoes went faster (entering the charts in February, 1951 and peaking at #6), but the 4 Buddies went further (first charting in April, and reaching #3 in a 9-week run). 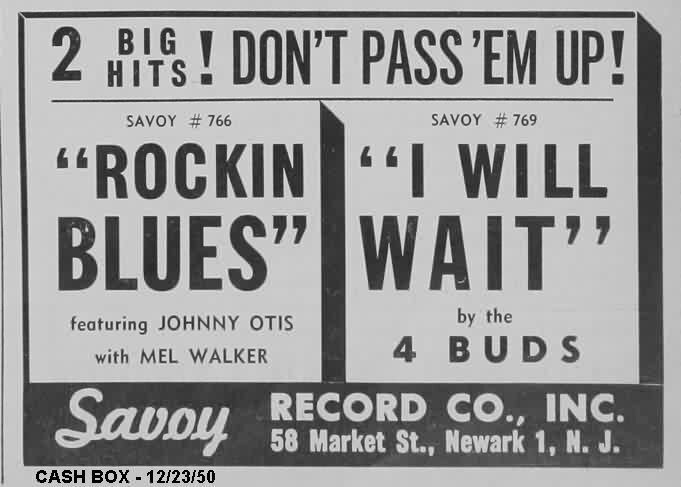 In spite of its strong showing, Billboard had only rated "I Will Wait" a 68; much lower than subsequent releases. Also around at the time was Billy Eckstine's "I Apologize," Amos Milburn's "Let's Rock Awhile," and Muddy Waters' "Long Distance Call." The 4 Buddies were on their way. And boy were they on their way! In early December, they played the Palace Theater (yup, the Palace Theater in New York). The reviewer didn't have a lot to say about them: he liked Tommy Carter's bass, but thought the group could use more commercial material. Can't say I ever heard of any of the other acts on the bill: Jackie Bright, Senator Murphy, the Two Valors, Lou Wills, Jr., Louise Hoff, Ricardo & Norma, and Professor Keller. The group was unofficially managed by Fritz Pollard (a former Brown university football star), who took an interest in them when they began rehearsing at his Sun Tan Studios in Manhattan. On January 13, 1951, the 4 Buddies returned to the studios to record four more ballads: "Sweet Slumber," "My Summer's Gone," "Moonlight In Your Eyes," and "It Could Have Been Me." The latter two sides were inexplicably never released by Savoy, but are as good as any of the issued material. In February, "Sweet Slumber" was paired with the older "Don't Leave Me Now" for their second release, although at this time, "I Will Wait" had not yet hit the charts. "Sweet Slumber" made some noise in several local markets, but never achieved the status of "I Will Wait." In fact, "I Will Wait" was to be their only Top 10 hit registered on Billboard's national R&B charts. In May, when they began touring on the strength of "I Will Wait," they decided to add a fifth member: Alvin Bowen became their guitarist and musical arranger. (He doesn't appear in any photos because the group's one and only photo session had already taken place.) He signed with Savoy on May 5, 1951, but the contract was then backdated to October 9, 1950, the same date as the others. At their third session, on May 23, 1951, they recorded another four ballads: "Close To You," "Window Eyes," "I'm Yours," and "I Love You, Yes I Do." Of these, only "Window Eyes" was ever issued. June saw their third release: "My Summer's Gone"/"Why At A Time Like This." The fiercest competition they (and everyone else) faced was the Dominoes "Sixty Minute Man," which hit the charts in June and stayed for 30 weeks! Also in June, the Clovers' first record, "Don't You Know I Love You," charted, giving the Dominoes a run for the money. In August, The 5 Keys' second release, "Glory Of Love," went straight to the top, and the debut of the Swallows ("Will You Be Mine") was right behind it. In October, the Cardinals' first, "Shouldn't I Know," also zoomed up the charts, along with the Clovers' "Fool, Fool, Fool." The Larks were there too, with "Eyesight To The Blind" and "Little Side Car." All this is to show that in the 4 Buddies' first year there wasn't much competition from groups, but what was there was extraordinary. 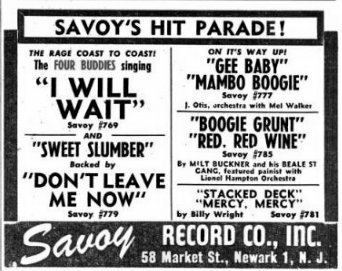 The only other Savoy activity in the Top 10 that year came from Mel Walker (with the Johnny Otis Orchestra) hitting with "Rockin' Blues," "Gee Baby," and "All Night Long." 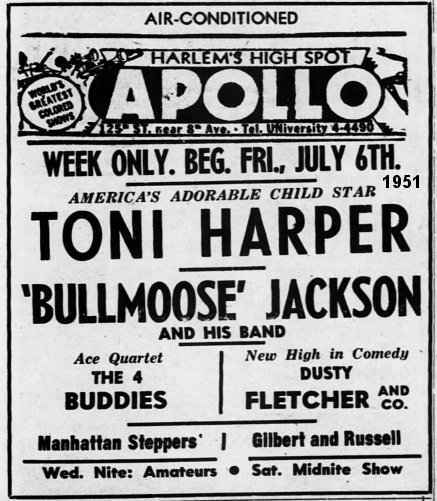 At the end of June 1951, they spent a week at the Earle Theater in Philadelphia (with Toni Harper, the 3 Peppers, and Patterson & Jackson). This was followed, on July 6, with a week at the Apollo Theater, along with Toni Harper, Bull Moose Jackson, and Dusty Fletcher. Three days later (on August 23), the 4 Buddies laid down another four tracks: "Sweet Tooth For My Baby," "Heart And Soul," "Sin," and "Simply Say Goodbye." 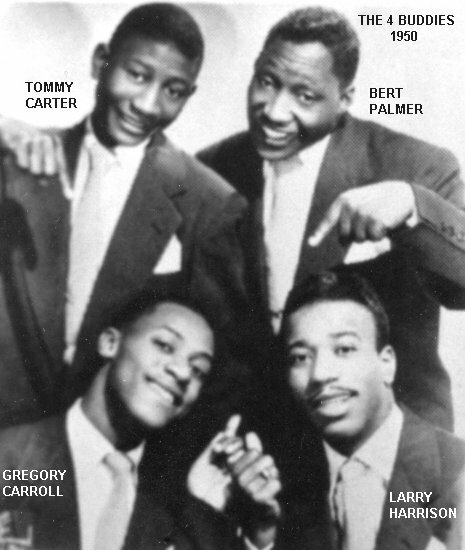 "Sweet Tooth" was the group's first up-tempo recording, featuring bass Tommy Carter in a Ravens-type arrangement. This and "Heart And Soul" are the only numbers on which Larry Harrison didn't sing lead. In September 1951, their next record was released: "Heart And Soul"/"Sin." When this didn't take off, Savoy paired "Simply Say Goodbye" and "Window Eyes" in December. And then all was quiet for a while. In November 1951, Savoy's Herman Lubinsky wrote the group a pretty nasty letter. He claimed that he could see the Dominoes and the Clovers all over the charts; where were the 4 Buddies??? He went on to tell them to stop fighting with everyone (and themselves) and to start getting hits. He might have been more tactful, but his points were well-considered (even though getting a hit usually had more to do with black magic and record company bribery than an act's talent). 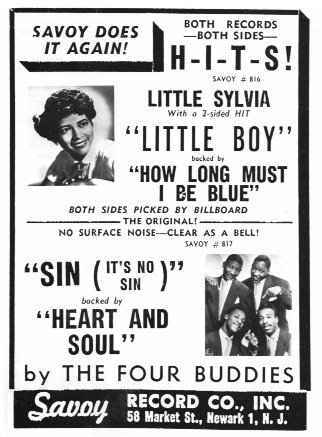 The early part of 1952 saw, in Billboard's Top 10, such group classics as "One Mint Julep" (the Clovers), "Baby Please Don't Go" (the Orioles), "Where Are You" (the Mello-Moods), "Wheel Of Fortune" (the Cardinals), "That's What You're Doing To Me" (the Dominoes), and "Have Mercy Baby" (the Dominoes). Conspicuously missing was anything by the 4 Buddies. 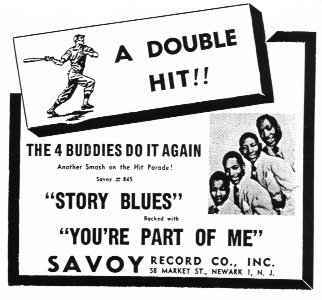 In May 1952, "You're Part Of Me"/"Story Blues" was released and not only ran into some of the above-mentioned competition, but also "Ting-A-Ling" (the Clovers), "Mary Jo" (the 4 Blazes), and "Beside You" (the Swallows). Also in May, they spent another week at Philadelphia's Earle Theater, this time in the company of Wini Brown, and Illinois Jacquet. The last 1952 release was October's "What's The Matter With Me"/"Sweet Tooth For My Baby." After the April 1952 session, bass Tommy Carter left and original Metronome Maurice "Tank" Hicks was called in to replace him. Soon after, Bert Palmer also left. He was initially replaced by Joseph Walker, who didn't work out, and then by their guitarist, Alvin Bowen, who added baritone singing to his accompanying. Note that Maurice Hicks was in and out of trouble. In July 1952, he was jailed for being $1420 in arrears of support payments. Hicks was sentenced to "two years in the House Of Correction on a nonsupport-of-family charge and another 18 months on his failure to make payments ordered for support of an illegitimate child." (So said "Singer Held, Back In Support Dues" in the July 17, 1952 Baltimore Evening Sun.) However, he was on the March 3, 1953 4 Buddies session (see below), so he must have come up with the money somehow. In January 1953, it was reported in one of those suspicious press agent blurbs that model Lee Knobloch had tossed aside Jimmy Grissom, vocalist with Duke Ellington, in favor of an engagement to Larry Harrison. Only a single session remained to the 4 Buddies. 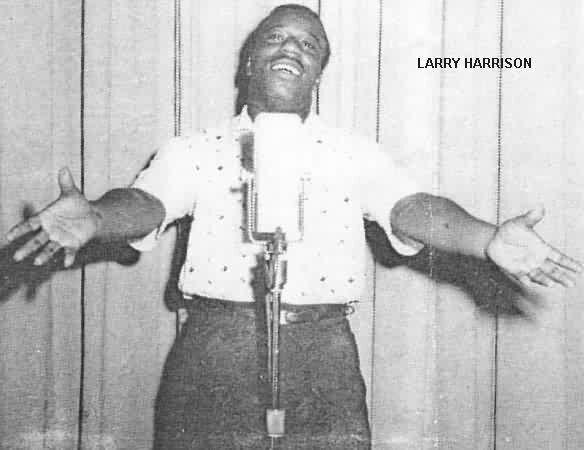 After almost a year's absence, they (Larry Harrison, John Carroll, Alvin Bowen, and Maurice Hicks) recorded four more songs on March 3, 1953: "You Left Me Blue," "Ooh-Ow," "Got Everything I Need But You," and "My Mother's Eyes." 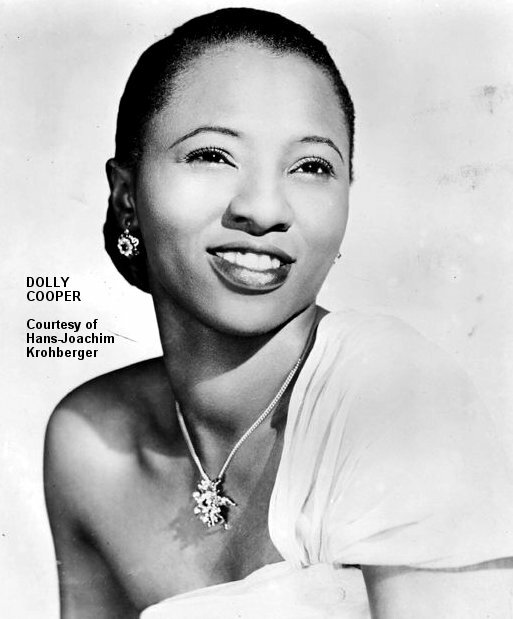 As the last song of the session, they went out the way they came in: backing up a female singer (in this case Dolly Cooper) on "I'd Climb The Highest Mountain." With the March, 1953 release of "My Mother's Eyes"/"Ooh-Ow" and "I'd Climb The Highest Mountain" in April, it was all over. 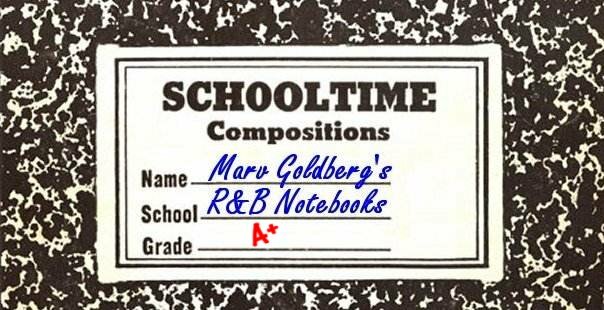 There was little money coming in, either from record sales or from songwriting royalties. They hooked up with booking agent James Evans, but the jobs they got weren't worth the effort. Around May, 1953, John Carroll (now known professionally as "Gregory Carroll") joined the Orioles, just in time to be on their smash hit of "Crying In The Chapel" (recorded in late June). He stayed with them until they broke up two years later. At that point, he went into the production end of the business for a while, before forming his own group, the Dappers in 1956. After this Gregory did several years of studio back-up work (much more financially rewarding than group singing), formed a gospel group (the Halos) in the early 60's, went back into production, sang with Jimmie Nabbie's Ink Spots in the 70's, and then returned to production work again. 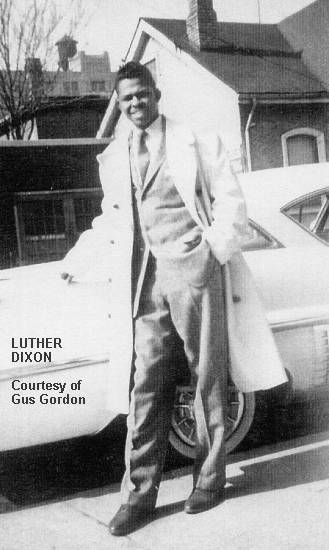 After the 4 Buddies, Larry Harrison formed a new group with Roger Wainwright (second tenor), Luther Dixon (baritone), and Danny Ferguson (bass). First recording as the Barons on Decca, on July 1, 1954, they laid down "A Year And A Day," "My Baby's Gone," "Forget About Me," and "Exactly Like You." The first two were issued in August, and the others in October. Later that year, Maurice Hicks replaced Danny Ferguson, and, calling themselves the Buddies, they recorded "I Stole Your Heart"/"I Waited" for Phil Rose's Glory label in early 1955. By the time the record had been issued (in March 1955), Maurice Hicks had departed to replace Johnny Reed in the Orioles. An interesting side from this period was "Ashamed," an unreleased Jubilee recording by the Ravens. The lead on "Ashamed" is a bit of a mystery. After it was suggested to me that the voice was that of Larry Harrison, I first had a couple of singers listen to it; both agreed that it was Harrison. I then tried to find out from Jimmie Steward, the only surviving member of the Jubilee group, but he basically (and suspiciously) refused to answer the question. It looks like, at least for a while in 1955, Larry Harrison replaced Jimmie Steward in the Ravens. 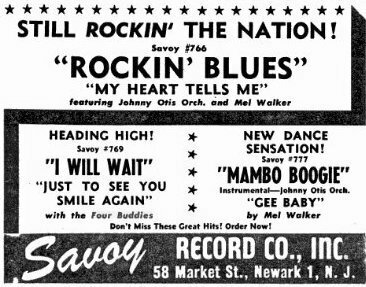 In August of 1955, Larry Harrison returned to Savoy to record some solo efforts. (These masters, "Move, Baby, Move" and a remake of "I Will Wait," were the last in the 4000 series.) When these didn't take off, he joined Gregory Carroll, both in the Dappers (along with original Raven Leonard Puzey) and in doing back-up work. Our old friend Maurice "Tank" Hicks turns up again in an October 14, 1960 article in the Baltimore Evening Sun. Titled "2-Year Terms Given 2 Men In Thefts", it talked about Hicks pleading guilty to "charges of theft from interstate shipment". He appears once more in the November 4, 1972 Evening Sun in an article titled "Robber Stabbed, Gets Eight Years". He and an accomplice knocked down and robbed a man on the street, but the man had managed to stab Hicks before the pair fled. He was arrested at a hospital. The 4 Buddies had a unique sound. They deserved better recognition than the record-buying public accorded them in the early 50's. Even most of their unreleased material is top-rate (which can't be said for many other groups). Special thanks to George Moonoogian and Ray Funk. (all leads by Larry Harrison, except "Sweet Tooth For My Baby"